Lucy, our protagonist, is the daughter of two of the aristocrats involved in arranging this outcome. Known as "the Farthing set", these aristocrats and conservative politicians have faded from the political mainstream after successfully outmanoeuvring Churchill and making peace with Hitler. When Lucy married a Jewish banker working on microloans to help disadvantaged people, her mother was horrified. A Jew in her family - such an outrage! So it is a surprise when Lucy and her husband are invited to a weekend party in her parents' countryside manor. An even bigger surprise is revealed in the morning, when one of the key Farthing Set politicians is found dead, with a yellow felt star stabbed into his chest. So begins a murder mystery unlike any other I've read. A smart inspector, supported by his earnest constable, is investigating the case. Immense pressure rides on its outcome - and keeping a bunch of very rich and powerful people restricted to a manor house quickly turns out to be half the challenge. Meanwhile, Lucy's husband quickly finds himself the prime suspect. Over the next few days, secrets, intrigue, and a growing number of bodies turn the investigation into an ever-more-complex mystery. Farthing is not just outstanding because the mystery at the heart of the plot is a well-executed homage to Agatha Christie style crime fiction. Nor is it the alternative history that makes the novel remarkable. Instead, it is the cast of worryingly authentic characters. Lucy, a former socialite whose motive for loving her husband is at least in part a rebellion against her unpleasant mother, is a flighty, shallow heroine to begin with. A homosexual inspector who, like most of British society, is antisemitic, but who does not let his prejudices colour his investigation. Antisemitism and prejudice (and people's responses to both) are handled very authentically in the novel. The plot progresses very smoothly from pure crime mystery to something much more thoughtful. To be honest, I didn't expect to like Farthing. While I generally very much enjoy Jo Walton's work, I also happen to have a dislike of fiction set in WW2 / Nazi times, and a dislike of period fiction about aristocrats flouncing about in period dress. 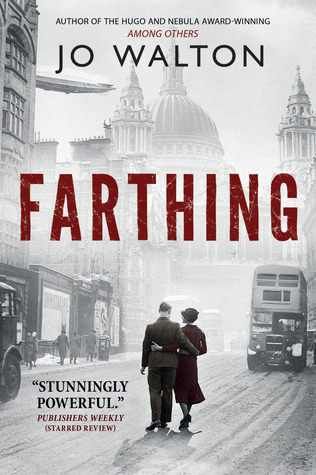 Farthing was thus a novel that I bought (due to being a fan of Jo Walton) and then ignored on my Kindle for years (due to its subject matter & cover). I'm glad that I eventually gave it a try. It's a smart, tense, compelling novel, worthy of praise for its originality, its pace, and especially for its authenticity. I'm glad you enjoyed it! It's a great book. I didn't actually enjoy the sequels as much, though they're good too.